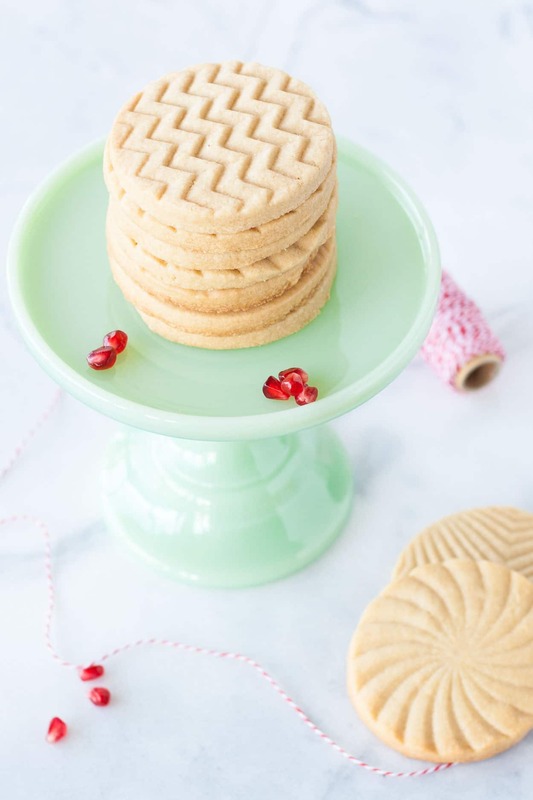 These Maple Sugar Cookies are simple, stunning, and delicious. Loaded with pure maple syrup, they are a perfect treat any time of year, especially during the holiday season! Nordic Ware sent me these Geo Cookie Stamps and Naturals Big Baking Sheet pan to try out, but have not compensated me monetarily for this recipe. All opinions are my own. If you haven’t already noticed, I’m 100% in holiday mode. My holiday baking has been going on for a few weeks now, and I don’t intend to stop until the clock strikes 2016. Christmas is slowly starting to infiltrate our apartment, and we’ll be putting up our tree next weekend (which is actually a week later than we usually do it). LOVE this time of year! 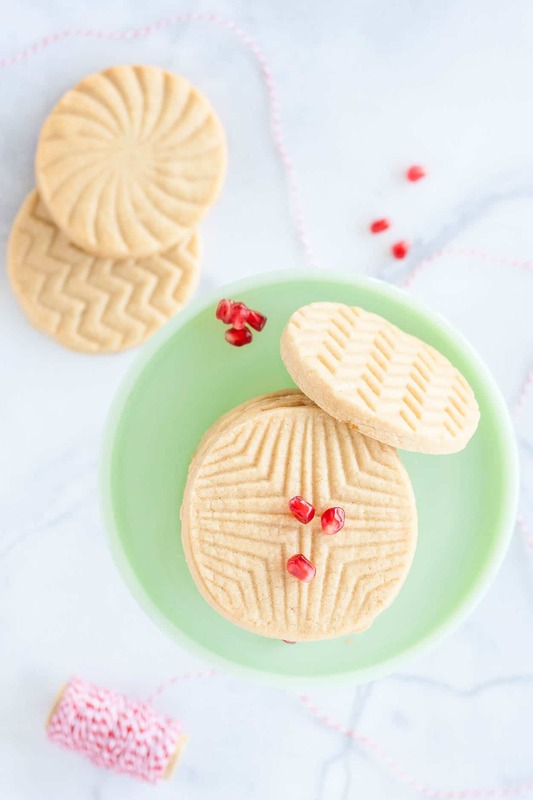 I’ll be focusing on holiday cookies for the next little bit because: 1) they’re easy (usually); 2) there’s a bunch of cookie exchanges going on, and; 3) they’re delicious. 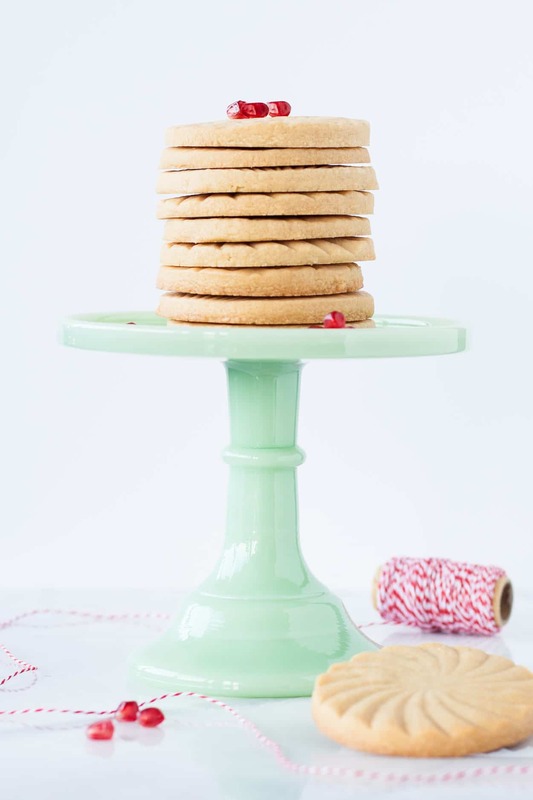 This week it’s these yummy Maple Sugar Cookies! I’m all about simple, pretty, elegant designs, which is I think why I love the Bundt cakes so much. 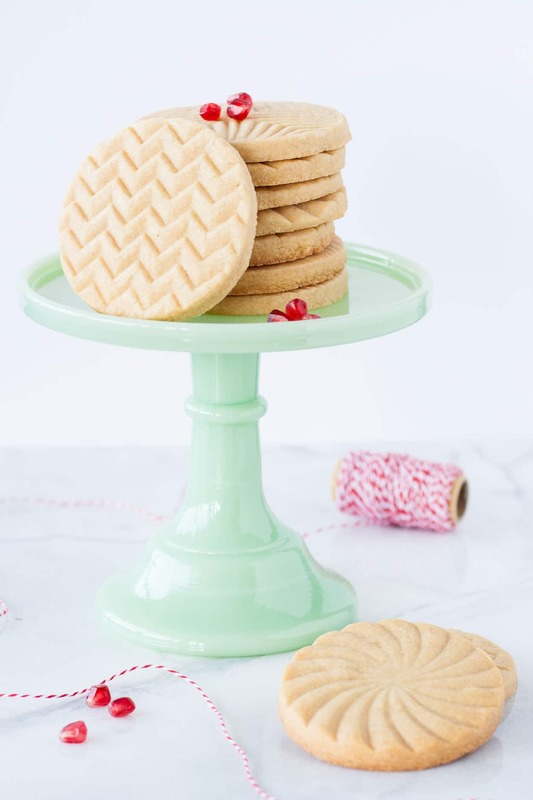 Nordic Ware is my go-to company for those, so I was super excited when they sent me these Geo Cookie Stamps and Naturals Big Baking Sheet to try out for this holiday season! I’ve seen cookie stamps around, but honestly I was a little intimidated to try them. I don’t do cut-out cookies often and I wasn’t sure how the stamps would work out. I imagined them sticking to the dough and generally not being very user-friendly. Thankfully I was wrong! 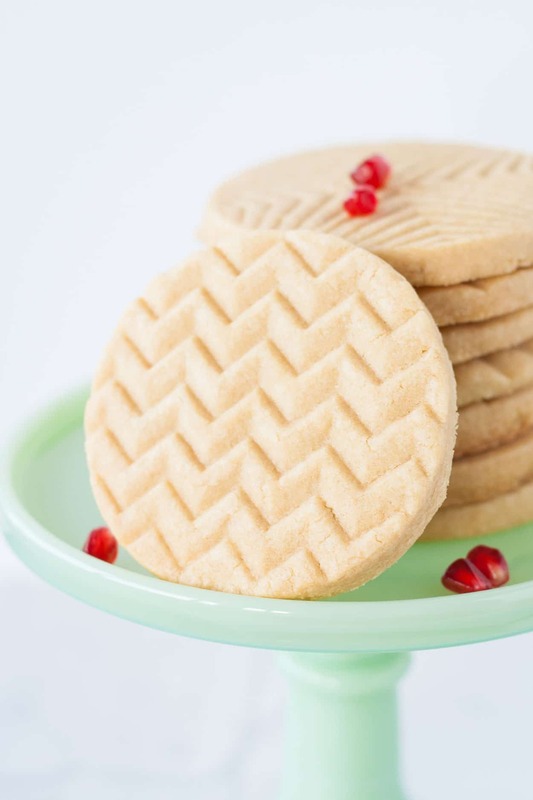 There’s a couple of ways you can make cookies with cookie stamps. There’s the easy way, and then there’s the way that I did it. Sigh. I’m going to tell you about both and you can decide which is best for you. The way *I* did it was to chill the dough, roll it out, stamp the cookies, use a cookie cutter to cut them out, then chill the cookies again before baking. This is a longer process, but does give you clean/sharp edges on your cookies. 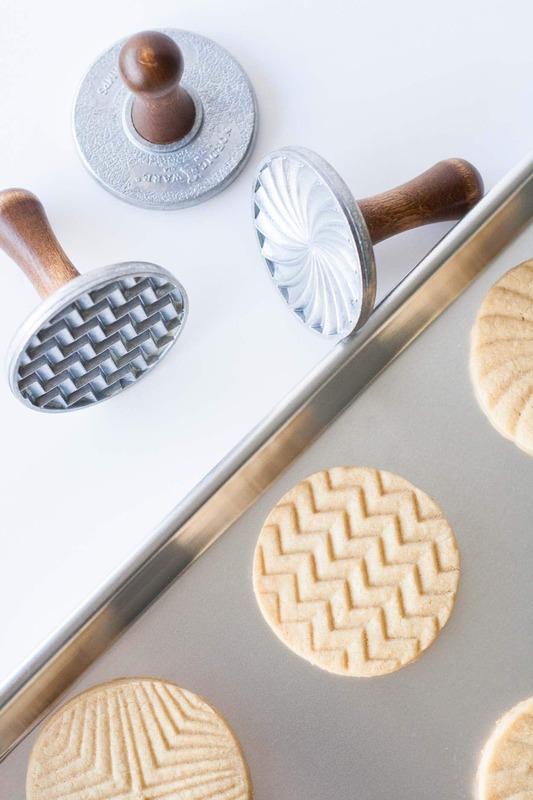 The easier method is just to scoop the batter right away, roll it into a ball, use the cookie stamp to press it down, and then chill the cookies. I realized this when I was using up my last scrap of dough — I just rolled it into a ball and stamped. I’m not sure why I didn’t think this idea would work in the first place. I thought the dough would stick to the cookie stamp because it wasn’t chilled, but it totally didn’t and was perfectly fine! This way gave more defined lines, as the dough was softer, but the edges of the cookie were more rounded. 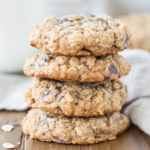 Either method you decide (I’ve included both in the recipe below), you’re sure to have stunning cookies that will impress friends and family! To make sure my cookie dough didn’t stick to the stamps, I dipped them into a small bowl filled with flour and brushed off the excess. 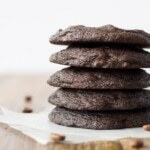 This would do a few cookies, then I would dip again as needed – worked perfectly. 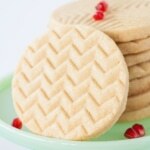 As with all Nordic Ware products, the quality of their Geo Cookie Stamps is amazing. They are quite rugged, made from heavy cast aluminum, and I love the vintage look of the wooden handles! The Naturals Big Baking Sheet is a winner too. 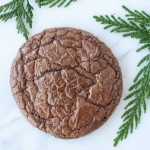 It’s high quality, and it’s nice and large, which means you can bake more cookies at a time! 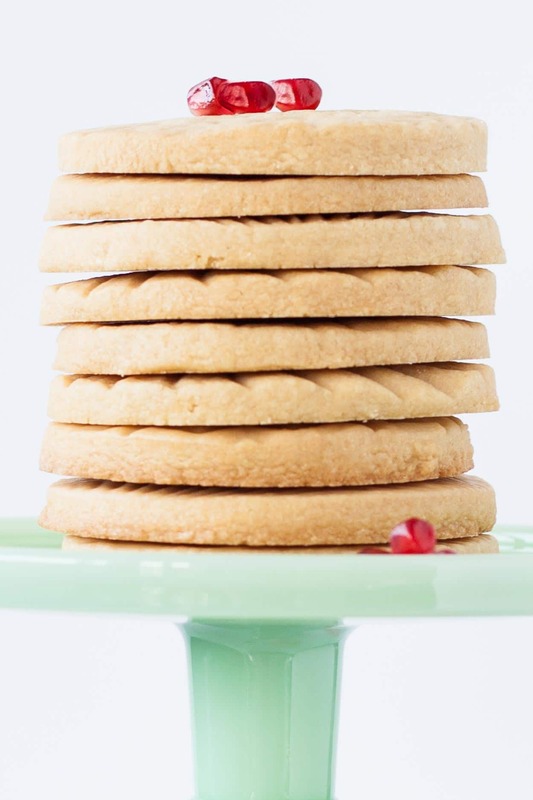 These Maple Sugar Cookies are simple and delicious. You don’t need a ton of ingredients or fancy decorations – they are perfect on their own. Sweet and soft, with the yummy flavour of pure maple syrup. If you’d like to kick it up a notch, you can dip them in a maple glaze or brush them with maple syrup straight out of the oven and then dust them with coarse sugar. I did a few with the maple glaze (not pictured) so I’ve included the recipe for the glaze below. Reduce speed to low and add egg yolk, mix until fully combined. Add maple syrup, mix until fully combined. Add flour and salt and mix until just incorporated. Scoop dough using a medium cookie scoop,(approx 1.5 - 2 Tbsp) roll into a ball and place on lined baking sheet. Dip cookie stamp into some flour and brush off excess. Press into cookie dough to flatten. Chill cookies until firm (approx.1 hour). Divide dough in half, shape into discs, chill for 2 hours. Roll dough out between 2 pieces of parchment to 1/4" thickness. Dip cookie stamps in flour, brush off excess. 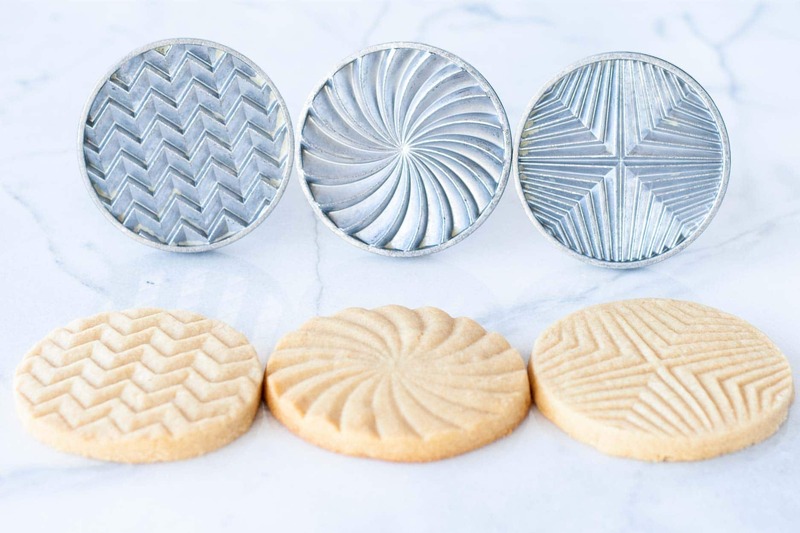 Press cookie stamps into dough, then use a round cookie cutter to cut cookies out. Reroll scraps as needed. Transfer cookies to lined baking sheet and chill until form (approx 30mins). Preheat oven to 325F. Bake cookies for 15-20mins or until lightly browned on edges. Cool on baking sheet for 5mins, transfer to wire rack to cool completely. Serve as is, or glaze with a simple powdered sugar and maple syrup glaze. Store in an airtight container. 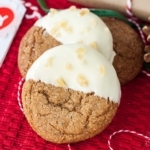 Adapted from Martha Stewart's Holiday Cookies Magazine (2010). This is not a sponsored post. Nordic Ware sent me the Geo Cookie Stamps and Naturals Big Baking Sheet for review. All opinions are my own. 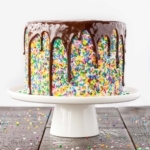 There is neither baking powder nor baking soda in this recipe? Please confirm for me. Hi Joyce! No, in order to ensure the cookies maintain their shape I leave it out. Terrible recipe. The dough was so sticky I had to chill before rolling it out AND after cutting them out just to be able to move them to the baking pan. And then they COMPLETELY lost shape and stamp in the oven! This recipe is not good for stamping or even cut-out cookies. I don’t want to be mean, but I do want to save others from the headache of a bad recipe. Hi Holly, sorry to hear you had trouble with this one, but it seems like something might have been off with your measurements. The dough should not be that sticky! If you don’t want to stamp them, can you bake as the ball or do you need to flatten them before baking? Hi Stacey! You should roll and cut them out. If you have a glass with a flat bottom, you can use that to do the first method. And you can also use a bowl of fine sugar rather than flour to keep things from sticking to the stamp/glass. Awesome tips Heather! Thank you!! Hi Liv, I have just been given your site from my daughter in law. 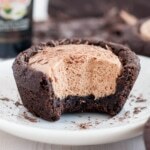 I am just an average baker, nothing fancy but, love to try new things. My question is , where did you but the cookie stamps form? . they are adorable. 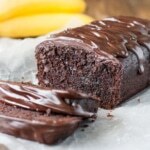 Thanks for sharing your recipes, I for one will be trying a lot of them. Cookies are fabulous and a big hit with my family! Tried without the glaze, but just in case we add it next time, what is the 1/4 unit of maple syrup? Thanks Jacquee! Sadly, I’ve paid for *most* of mine :D.
These are beautiful Olivia! Just love the addition of maple syrup. Pinned! Thanks Jess! The maple syrup gives them such a delicious flavour! Thanks Jess! Aren’t the cookie stamps so pretty?? Love them :). This New England girl love all things maple! Gorgeous cookies and perfect for exchanges and dipping in my maple pumpkin dip. Oh yes. Love the cookie stamps!!! Simple and elegant.